Oh my gosh. I just found out that the stove in our rental apartment (where we’ll stay when we first move to Grosse Pointe) has an electric stove. I’m kind of freaking out. 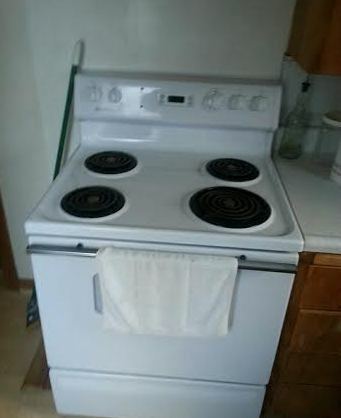 I don’t know what it is, but I have a huge aversion to the electric stove. I see one and I make a funny noise and start backing away with my hands covering my face. I need to preface this rant by saying that I am first of all grateful beyond words to friends who are renting us the apartment dirt cheap, not to mention having to fix the place up for us and move a houseful of furniture elsewhere, just so we can move in all of OUR crap. But back to the stove. Cooking is one of the things that makes me happy. And I am going to need to go to my happy place a lot in this apartment, I just know. Does anyone out there have any tips on how to cook electric?! How not to burn popcorn, for example? Really, how not to burn anything. Or how to bring a delicate sauce to a slow simmer? Or how to remember not to put my hand on a hot burner that wouldn’t still be hot if it were a gas stove! This entry was posted in Cooking, Food, Grosse Pointe, Life, Places, the Apartment and tagged Apartments, Cooking, Family, Grosse Pointe, Life, Meals, Moving, Rentals, Stoves. Bookmark the permalink. Thanks for the follow…I’d love to know how you found the blog! :) And…figure out how hot the heat is on the stove by practicing with frying/scrambling eggs. (On mine, 4 is perfect for meats and sauces but cooks pancakes too fast.) And for burning your hand…just empty your pan and leave it on the stove for 15 minutes or so, til you know it’s not hot any more. I find I’m a lot less likely to touch even a cold pan than a cold stove. Hi! Thanks so much for the tips. I guess we’ll be eating a lot of eggs the first week :). I found you b/c you had Liked a post (I forget whose, sorry) that I Liked, and I saw the baby on your Gravatar and had to click on him! We will work through it. I grew up with electric, had a gas stove for 6 years in our first apartment, electric again for 23 years and now gas for the last 15. Somehow I made it through it all okay. You are a great cook and this will just be a new adventure! I know you can do it. Thank you! I think I can conquer the stove. Just not looking forward to all the mishaps in order to get there!